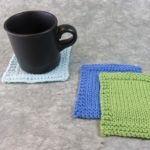 Knitting Teacher Packs are designed to be an “out of the box” solution for beginning and intermediate knitting classes. These packs contain reproducible patterns and handouts for students as well as detailed teacher notes. Teacher Packs will provide you with preparation and promotional details for the class, student materials lists, teaching notes and timelines for each part of the class, and potential student problems and solutions. Teacher Packs have been class tested and tech edited for correctness and clarity. Purchasing a Teacher Pack gives the purchaser the right to reproduce the pattern and teaching materials for teaching the class unlimited times in one location. If more than one teacher would be teaching the class in the same location, each teacher should purchase his/her own teaching pack. If one teacher is using the pack in multiple locations, then he/she should purchase one pack for each location that the class is being taught. If you have any questions about copying and distributing this teacher pack, please contact me at heddicraftdesigns@thecraftstudio.com. Knitting 101 is a perfect tool for a busy shop owner or knitting teacher. The pre-written and tested curriculum removes the pressure of having to write a class and then not knowing whether or not your class has included all the information and skills that it should and if it is the right length. Heddi’s thoughtfulness and experience as a knitter and instructor shines through in these materials. From how to prepare, what to say, to how to help students fix common mistakes, she has included everything you need to give an excellent first class to a brand-new knitter. In the time that it takes to read the material and knit the samples (hey, do both at the same time! ), an experienced knitter can be ready to instruct. I especially like how the class is constructed; it teaches the new knitter the techniques of casting on, knitting, and purling, etc. while leaning to read a simple pattern. 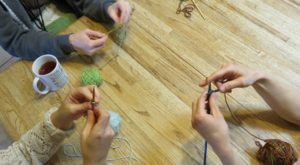 My students weren’t overwhelmed and were absolutely thrilled to be given all the skills they needed to jump right into knitting in the course of a couple of hours. View a sampler of teacher pack pages that includes pages from the Knitting 101: Lesson 1 pack and from the Knitting 102: Lesson 1 pack. Intro to Knitting This teacher pack is designed to teach students who have never knit before to cast on, knit, purl, and bind off. * One two page reproducible pattern for a Mug Rug. * One seven page reproducible student handout that give students details and additional information on how to complete each part of the pattern. * One six page teacher guide for the teacher’s personal use only that gives preparation and promotional details for the class, student materials lists, teaching notes and timelines, and potential student problems and solutions. Intro/Refresher to Knitting This teacher pack is designed to teach student who have never knit before or those who have been away from knitting a long time to cast on, knit, purl, make a simple yarn-over buttonhole, and bind off. 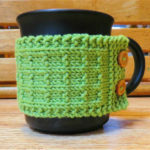 * One two page reproducible pattern for a Coffee Cup Cozy. * One eight page reproducible student handout that give students details and additional information on how to complete each part of the pattern. Intro to Knitting in the Round This teacher pack is designed to teach students who know the basic knit and purl stitches to cast on in the round, knit and purl on circular and double pointed needles, and work k2tog and p2tog decreases. * One two page reproducible pattern for the Gusty Blustery Hat. * One nine page reproducible student handout that give students details and additional information on how to complete each part of the pattern. * One seven page teacher guide for the teacher’s personal use only that gives preparation and promotional details for the class, student materials lists, teaching notes and timelines, and potential student problems and solutions. Intro to Lace This teacher pack is designed to teach students who are confident with knits and purls to work a yarn over increase, work left and right leaning single decreases and left leaning double decreases, read a simple lace chart or written directions, and interpret “No stitch” symbols. 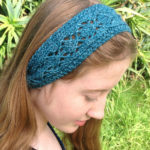 * One five page reproducible pattern for the Diamond Lace Headband. * One six page reproducible student handout that give students details and additional information on how to complete each part of the pattern. Intro to Cables This teacher pack is designed as an introduction to cables for students who are confident with knits and purls. Students will learn to distinguish between different types of cables, work simple travelling and rope cables, and read charts and written directions for cables. * One five page reproducible pattern for the Cabled Phone Cozy. * One five page reproducible student handout that give students details and additional information on how to complete each part of the pattern. Intro to Slip Stitch Patterning introduction to slip stitch knitting, working slipped stitches from charts and written directions Coming Soon! 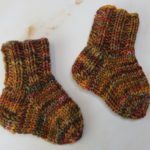 Intro to Top Down Sock Knitting This teacher pack is designed as an introduction to top down sock shaping for students who are comfortable with knits, purls, and decreases. Students will learn to identify the parts of a top down sock, make a smooth join in the round, work a heel flap, heel turn, gusset, and star toe. By the end of class, they will be ready to work a similar adult-sized sock pattern. 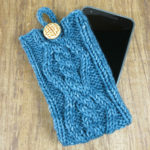 * One four page reproducible pattern for the Cabled Phone Cozy. * One two page reproducible student handout that give students details and additional information on how to complete each part of the pattern. Learn to Shape and Pick Up Stitches working a mitt with a thumb gusset, holding stitches out of work, picking up stitches, working in the round on a small circumference Coming Soon! 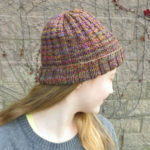 Patterns include only the following skills: cast on, bind off, knit, purl, along with the occasional yarn over, knit two together, and purl two together. These are simple patterns to learn the basics of knitting with in class practice and support for the yo, k2tog, and p2tog. There is little shaping to the patterns and gauge is not critical to the project. These patterns assume confidence in forming knit and purl stitches and in casting on. These patterns use more complex stitch manipulation in one or more colors of yarn to create lace, cables, slipped stitch patterns, or stranded patterns. These patterns use minimal shaping and gauge may or may not be critical. These patterns assume confidence in the skills in Knitting 101 and 102 patterns. They focus on shaping methods to make garments that fit the body well and rely on accurate gauge. These patterns include sweaters, socks, mitts, etc. and although teaching focuses on shaping, some pattern stitches may also be included in the instruction.